“I felt like a corpse with a pulse. Imprisoned in my own mind and I had no idea how to escape,” says Jo Huxster, 29, on her history of mental illness and depression. 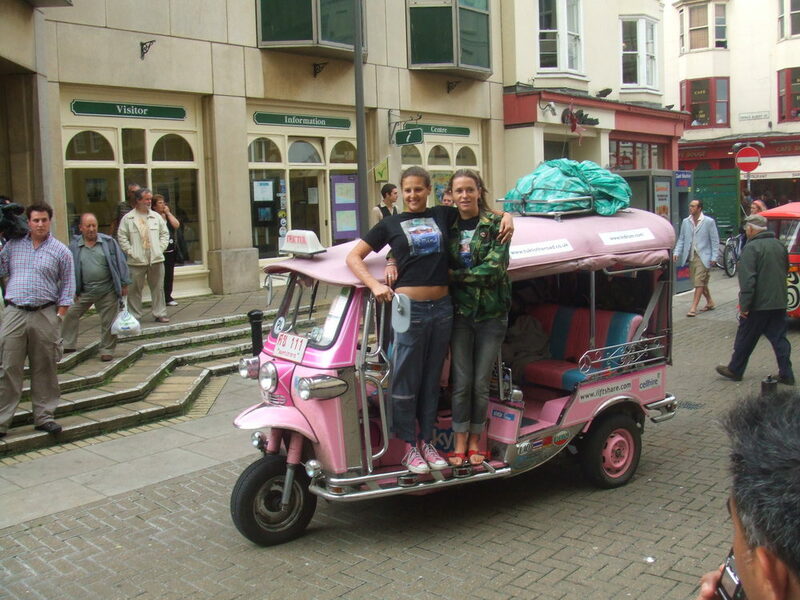 Yet escape came, in the form of a bright pink tuk tuk, friend Antonia Bolingbroke-Kent and a journey from Bangkok to Brighton. “It’s Jo’s fault. She had the idea of driving a tuk tuk from Bangkok to Brighton six years ago when on holiday in Thailand. Then in 2006 the opportunity arose as I ditched my job and Jo had a year off university, so we took the chance and just did it,” says Antonia, who is also 29. The adventure was not only to change Jo’s perception on life, but also the fortunes of others by raising £50,000 for mental health charity Mind. “We chose Mind as I had mental health problems in my late adolescence. I think an apt description would be cancer of the soul or malignant sadness,” says Jo. 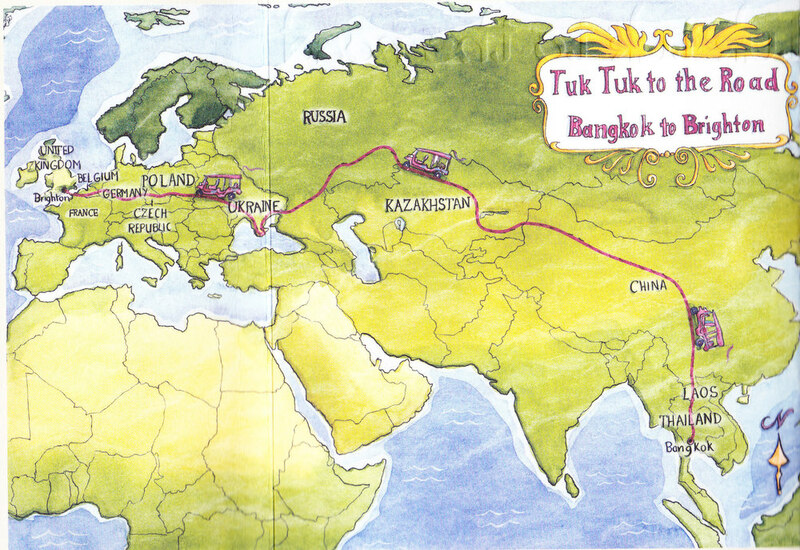 It was Jo’s trip to Thailand in 2002 that proved a turning point in her life and inspiration for the tuk tuk adventure. Before, she had been in and out of psychiatric hospitals for four years, carving ex-boyfriends’ names in her forearm with a compass and covering the scars by wearing long sleeves to avoid embarrassment. After spending four years in and out of psychiatric hospitals, Jo threw herself into an academic life at university and with the help of anti-depressants and a trip to Thailand, the dark cloud of depression began to clear. Yet a couple of days later Ting Tong was ready to hit the road. Antonia describes her as “the pinkest, sleekest, hottest three-wheeler in history to be unveiled to the world”. Their tuk tuk was custom built specially for their mission, and like the rest of their trip was paid for by sponsors. Jo and Antonia describe how she developed a personality along the trip and now is still taken out of Jo’s parent’s garage in Surrey for an occasional spin. Leaving the chaos of Bangkok, the two girls and their new friend Ting Tong travelled north through Thailand and into Laos. At the border they met their first challenge as a law had been recently passed banning Thai-registered vehicles driven by foreigners getting through. “We approached the Thai-Laos border with bated breath and butterflies in our stomach. Jo was in charge of the paperwork until we left China so she disappeared into a mysterious ‘Room 6’ at customs and emerged triumphantly an hour later with special permission to enter Laos,” says Antonia. After some unimpressed visits to sites where The Beach was filmed, the trio drove through Laos effortlessly with the only pest being inebriated locals. “In Vang Vieng one night we were followed home by a drunk guy who repeatedly said to us ‘I love you Mr Ant’,” says Jo. As they ventured into China the roads deteriorated and they were banned from the expressway due to their three-wheeled transport. The only option was pot-holed mountain roads. After several days of rough roads and repairs to Ting Tong, Jo and Antonia came across a major obstacle. Antonia and Jo both describe how north China stood out the most during the whole trip, partially due to feeling so far from home but also because of its size and the physical and mental challenges they encountered along the way. “In all the Russian speaking countries the men were very macho but they fell in love with the bight pink tuk tuk. She makes everyone smile, even the big hairy Russian men,” says Jo. “The Ukraine was perhaps my runner up for favourite countries, mainly due to its people, beauty and nightclubs,” says Antonia. The last stage of their journey was Europe, starting off by exiting the Ukraine and entering Poland. It was then followed closely by Prague, Cologne, Brussels and Brighton. The end was close but there was still much to do. “It started to rain near Krakow, Poland, and continued to do so most of the way back to Brighton. Ting Tong developed a whole host of problems and the closer we got home the more troublesome she was,” says Antonia. Traipsing through Germany, Belgium and France the trio stopped off at sites such as Auschwitz but hurried to get home within their time schedule and in fear of their beloved Ting Tong falling apart. Their last day involved a ceremonial 20 mile stretch to Brighton with a host of British tuk tuks to finish the journey in style. “Most of us know that post-exam feeling: you’ve been focusing on something for weeks, unable to see beyond that final wonderful moment when you walk out of the exam room for the last time. You celebrate wildly, and then ‘The Void’ appears. ‘What next?’ you wonder. Arriving in Brighton on 3 September 2006 was akin to walking out of that exam room and reaching that point that has always seemed so far away,” says Jo. After 14 weeks the girls had to return to reality and the trip was over, but both are now pursuing completing new adventures of their own. Jo is now married to her Indian husband Raja and they are expecting their first child next month. Another trip doesn’t look likely in the near future with Jo’s new commitments and another four years left as a medical student. “It would be a shame not to take Ting Tong on another exciting trip. I suggested to my dad I could drive her to India, but there are no immediate plans,” says Jo. Antonia, however, has chosen to continue travelling across borders in strange modes of transport. Now working on a small team called The Adventurists, she offers the opportunity for a similar adventure to Jo and Antonia’s tuk tuk journey. The company launched five years ago with their Mongol Rally, a 10,000 miles trip to Outer Mongolia on the world’s hardest terrain “in a car more suited to grinding coffee”, says Antonia. Since its beginning it has raised over $1 million for charity as entrants must raise at least £1000 per car. Now they offer other unique experiences such as the Africa Rally, Ruta del Sol through Latin America and something scarily similar to the tuk tuk adventure – ‘The Rickshaw Run’. “We raise a significant amount of money for various charities, and our ‘Tuk tuk to the road’adventure is still receiving donations,” says Antonia. ‘Tuk tuk to the road’ is a diary of their trip with Ting Tong and is on sale now. Video footage is presently being edited and there are talks about turning it into a documentary, but nothing has been confirmed yet.